The web is a little fucked up right now. Governments are spying on civilians, some block specific websites, and companies like Amazon have a stranglehold on the cloud services business. But what if we could create a decentralized web, with more privacy, less government control, and less corporate influence? 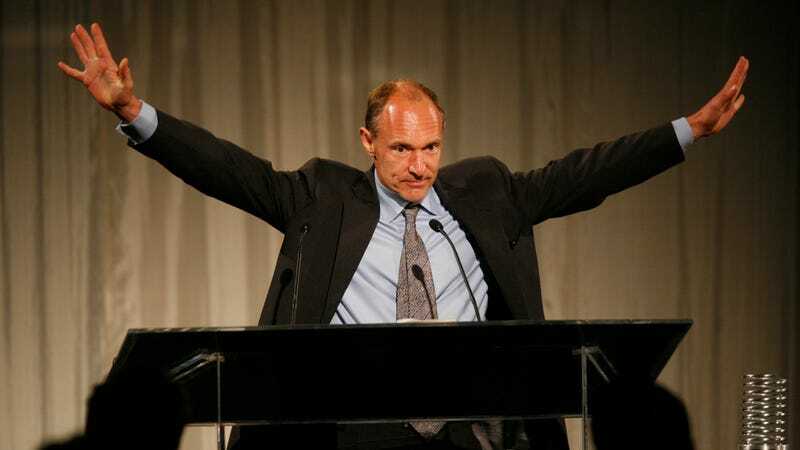 Tim Berners-Lee, inventor of the World Wide Web, wants to do exactly that. Sir Tim recently gathered some top computer scientists in a San Francisco church at an event called the Decentralized Web Summit, where attendees brainstormed ways to make the internet more broadly distributed. The smartest technologists on the planet showed up to join the discussions including early internet architect Vint Cerf and Brewster Kahle, founder of the Internet Archive. During the summit, dozens of sessions were held about creating an internet with no central control. Topics of these discussions included new methods for distributing web pages without using a standard web server computer, adding encryption to various parts of the web, and archiving all versions of a web page. There was also a session on payments and blockchains. Every discussion was focused on how to distribute, process, and host data with no centralized control. Recent reports about government spying and the influence of companies like Facebook, Google, and Amazon have heightened concerns in the technology community over who controls our data. It’s important to note that the creators of the summit do not intend to change online services like Facebook or Google. Instead, they are looking at ways web pages are created, named, and managed. In the current system, it’s easy for governments to track people by simply looking at internet addresses and who is visiting sites. In the future, it may be harder to identify how someone is using the web. The idea of creating a decentralized web has been around long before this week’s summit. Tim Berners-Lee has actually been beating this drum for years. In 2014, he said it’s concerning to be “reliant on big companies, and one big server” because it’s something that he believes stifles innovation. At this week’s summit, Berners-Lee appeared to clarify his sentiment. “The web is already decentralized,” said Berners-Lee, the inventor of the web. “The problem is the dominance of one search engine, one big social network, one Twitter for microblogging. We don’t have a technology problem, we have a social problem.” So even if the summit’s attendees are able to decentralize the web from a technical standpoint, the issue of companies like Facebook and Google controlling so much will still need to be addressed.